When Sarah Ulerick and I taught the first section of what became the Honors Capstone Seminar, I found that my experience with my own academic project at that time paralleled some of the students’ experiences in the class. The seminar focused on group research projects and culminated in a student-led, public symposium featuring panels of experts. I was also organizing a panel on American haiku for the American Literature Association’s conference held in San Francisco near the end of the term. As the students were preparing to present their research findings, I was preparing to present mine in a paper on the American haiku panel. When the students became stressed that not all of their invited panelists were going to be able to attend the symposium, I shared with them that one of my panelists had cancelled at the last minute. In short, they came to see that they were part of the scholarly community and their experiences were consistent with what often happens to all scholars involved in research and in professional activities. Over the past few years of teaching Lane’s two honors seminars, both of which focus on research, I have consistently seen how beneficial it is for the students and instructors to share their work with one other. To be honest, I am sometimes surprised that sharing my work in literary studies is of interest to them since very few of our students are English majors; however, I recognize that it is simply interacting with someone who is researching in their field, whatever that field may be, that most interests them. One benefit for the students, I think, is to recognize that what they are doing in the seminars is not a rote exercise. It is both training for the work they will do in upper division and graduate courses and an opportunity to answer real research questions and share their findings with relevant audiences. It is also consistent with what all scholars do and what they see their instructor doing outside of the classroom. The sharing of our research-related work offers many benefits to me, but one was particularly emphasized this past weekend. Last term, I worked on a paper about Richard Wright’s haiku and American Imagism for the Modern Language Association’s convention. As we began this term and the Honors Invitation to Inquiry Seminar, I traveled to Vancouver BC to present my paper. What I discovered as I worked on the paper was that I kept running into dead ends. I knew I wasn’t getting at what I wanted to say. It was only as I finished revising the paper and presented it at the conference that I finally arrived at the question I really wanted to answer. 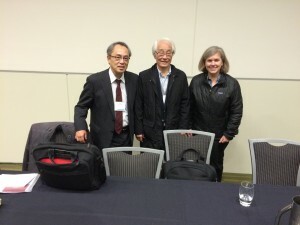 With Toru Kiuchi and Yoshinobu Hakutani after our panel. This experience was such a basic research experience that it took me by surprise. It has been a long time since I’ve done that much work only to arrive at my actual starting place in the conclusion of my paper. I was reminded that the obstacles my students face each year in the seminars are also the obstacles and the process I experience in my own work. I’ll be sharing this insight with them this week as they hone their research questions and I begin the line of inquiry my conference paper ultimately directed me to. This entry was posted in Research, Seminars, Uncategorized and tagged haiku, Imagism, Richard Wright, Sarah Ulerick, Toru Kiuchi, Yoshinobu Hakutani on January 12, 2015 by Ce Rosenow.